DOCTOR WHO - Which are the best COLIN BAKER stories? | Warped Factor - Words in the Key of Geek. DOCTOR WHO - Which are the best COLIN BAKER stories? In the latest installment of our look back at the finest stories from each Doctor's era, Dominic Fellows guides us through five of the best from the Sixth Doctor, Colin Baker. The era that no one likes to talk about, the era with worst opening story, the era that’s a victim of its time, the era that felt the wrath of Michael Grade. For many it’s where the rot set in. I didn’t see these stories on original transmission. I saw them much later, out of context and well prepared for what to expect. And it really isn’t at all bad. I bet no one ever expected this to make a ‘best of’ list but I have always I loved it. For starters it’s fun and straight forward; it’s about entertainment and nothing more. It’s also hilarious. Timelash is so ‘in-your-face’ with this over-the-top approach that it’s better to assume that it’s meant as a parody and as such, its spot on. With dialogue such as; ‘Very well, I shall be unreasonable!’ and ‘Another excursion into the realms duplicity’ playing wonderfully to melodrama clichés. On top of this bits of the wobbly scenery are actually decorated with tinfoil and tinsel. Ok, this should not be a good thing but in ‘Timelash’ it’s so blatant there’s a kind of integrity to it, the films of Ed Wood spring to mind. Even the editing is funny. 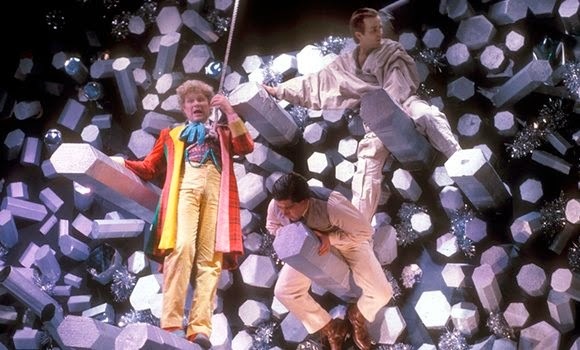 When the Doctor gently enters the Timelash and three grown men struggle to hold onto the rope with yelps of ‘the force is too great!’ A force of such velocity it causes Herbert’s accent to slip ‘It was nuffink’. You can’t help but wonder that if ‘Timelash’ had a self-aware line like ‘Karfel’s a dreary place. Dull, flat and inhabited by a bunch of hams’ then all might have been forgiven. ‘It’s too violent!’ That’s what everyone says. But is it though? The argument would suggest that it became more realistic yet lacking in consequence. I would argue that ‘Attack’ more than any other story deals with consequences. Almost every character is out for themselves, but there is no moralising here, simply ‘this is what we want; this is how we get it’. Even the Doctor and Peri are not innocent and while Lytton turns out to be a good guy whether this is because he genuinely sympathises with the Cryons or simply because they paid more is never clear. The only characters with pure motives are the Cybermen. They need to survive and they do. And everyone dies. The Doctor is even questions if he is right to judge the way he does, this is more powerful than it appears taking into account that he and Lytton only meet very briefly in ‘Resurrection of the Daleks’. He can be as jaded as the rest of us. He saves the day but it comes at a philosophical cost, this is an aspect of the character we rarely get to see. By the laws of TV The Doctor has to win, that’s how the show goes on, but to have it come at such a personal cost to him just adds another dimension of jeopardy that you don’t get in other shows. Just what does a story that is so spectacularly incoherent have going for it? It’s all about the moments, moments and characters. There are so many great ones it rises above its failures to be very pleasurable viewing. The Doctor is given one in the first episode as his assertion, on finding the Earth destroyed, that ‘nothing can be eternal’ is oddly comforting, haunting and heart breaking in equal measure and then moments later declaring that he can’t possibly move on when there is a mystery to solve, a very fitting statement of the characters motivations. Crozier is possible the only Doctor Who villain who is not particularly villainous, to the extent that he gets to say ‘I’m not without pity’. Drathro has some wonderfully witty dialogue, when told that there’s never been a blacklight explosion he dryly retorts ‘There will be soon’. Kiv is presented as a cantankerous old despot long past his prime, negotiating plans seemingly for something to do as he argues for ‘an important fish concession’ to which Sil reminds him ‘you hate fish’ which is amusing in itself but when Kiv looks confused and replies ‘Do I?’ one can’t help but chuckle. There is something insanely brilliant about Mr. Popplewick. Place The Doctor in a nightmare world and the first person he encounters is the ultimate bureaucrat. There is something very right about that. And of course, The Valeyard. Quite simply one of the greatest characters ever created for the show and the revelation of his identity is just thrilling. So ‘Trial’ may not work but it does have far more magical moments and characters than any other story and that in itself embodies a certain kind of indefinable magic. If’ Timelash’ is parody, then ‘Revelation’ is a black comedy. 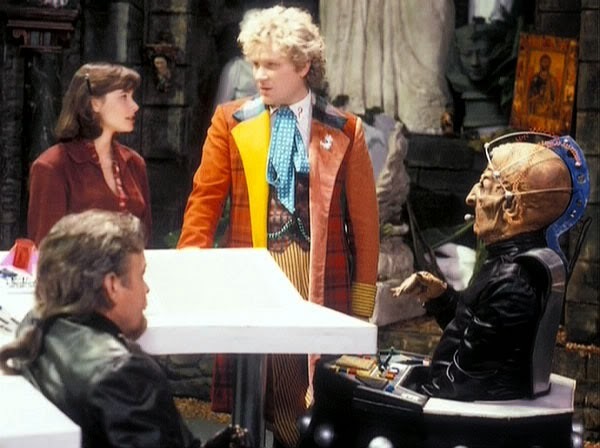 Davros ‘ line about consumer resistance wonderfully pre-empts Heath Ledger’s Joker by being both repugnant and amusing, as is Colin Baker’s ‘no ‘arm in trying’ a moment often criticised but as he is saying it to the creator of the most evil race in the universe I’ll let him off. So dark it’s a prime example as to why Doctor Who struggled in the 80s and could never thrive in the 90s. In the 60s, 70s and now Doctor Who enjoys it place as family entertainment. ‘Revelation’ is not family entertainment. Neither is the previous years ‘The Caves of Androzani’. And yet these particular stories are two of the most highly regarded 80s adventures. Growing up in the late 80s and 90s family entertainment meant variety shows and game shows. Sci-fi meant ‘cult’ or ‘adults only’. Doctor Who has never sat comfortably in either of these categories and yet for it to thrive in those days, episodes like ‘Revelation’ would have to become the rule rather than the exception. I think that would be a great show, but it wouldn’t be Doctor Who so ‘Revelation’ will just have to settle for being exceptional. 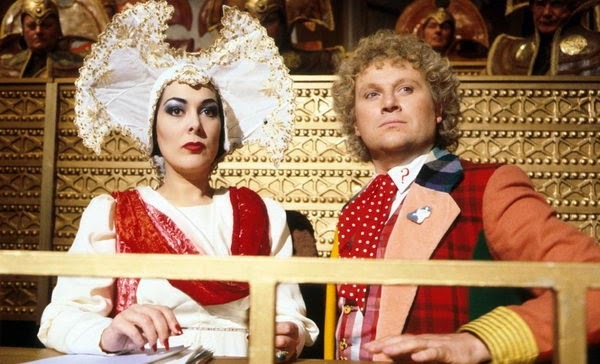 The definitive Sixth Doctor adventure. At the most basic level it’s simply a good story. It’s got a few comical moments (dodgy fly effect), It’s quite violent (acid bath), great characters (all of them) and it’s got some brilliant moments, bucking the trend of the ‘happily ever after’ the final shot of Arak and Etta realising they are free and simply staring at a blank TV screen not knowing what to do is superbly unsettling. 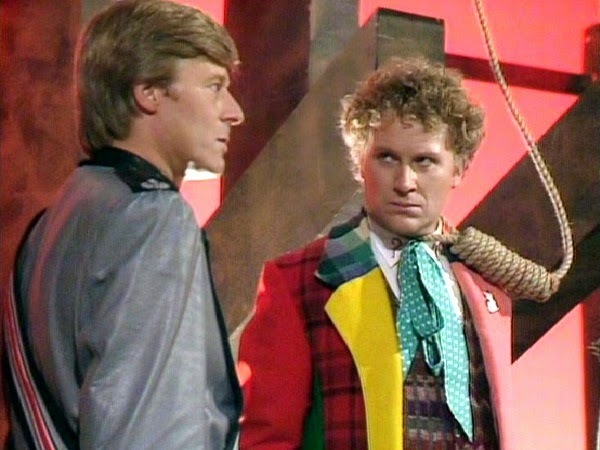 Its critics have noted that The Doctor does not actively set out to stop the Varos regime but it happens as a side effect of him being there for another purpose entirely. As fans we do the show a disservice here by forgetting that each Doctor is still the same man. To put this in context, as Baker’s third outing after ‘Twin Dilemma’ and ‘Attack of the Cybermen’ we were still waiting for this Doctor to show his more compassionate side. Because it’s a different actor we forget that this is exactly the same man who only mere days earlier effectively gave his life to save a women he barely knew. We can therefore take it for granted that he was appalled by the situation on Varos and would do anything to stop it. He doesn’t need to go barging in and make an impassioned speech about how wrong everybody is, he just gets stuck in and gets on with it. Which is a very fitting epitaph for The Sixth Doctor. We didn’t always agree with him and we didn’t always like him but he just gone on with it and got the job and done. And we loved him for it. 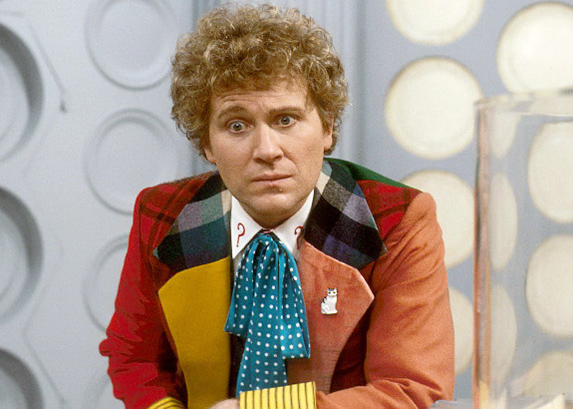 So which do you think are the best Colin Baker Doctor Who stories? Do you agree with Dominic's choices, or do you have a different top 5? Why not give us your selection in the comments below. Next time it's the turn of the Fifth Doctor, Peter Davison.